Home ~ Presentation Psychology ~ No Presentations: Is the Pen Mightier than the Slide? No Presentations: Is the Pen Mightier than the Slide? In case you missed the post on Monday, I recently had the opportunity to speak without the aid of a presentation. A bit uncomfortable for me, but I wanted to prove that there is no reason to hide behind slides and design to effectively (memorably) present information. How did I do? I’ll let you be the judge. Below is a link to the whole presentation; it’s about 45 mins long and the team are working on cutting it up a bit to produce two short segments. Frankly, it was much better than I thought at the start. The technology for sharing the diagrams I was drawing didn’t work as well as hoped. The projector wasn’t bright enough and the video camera that was supposed to be showing the hand drawn visuals arrived with no power cable and so we had to improvise. 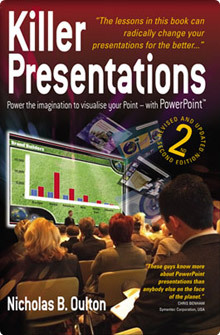 What most people do with PowerPoint hasn’t changed from what we used to do 20 years ago with acetate and overhead projectors… which is bizarre, if not ridiculous. Before reaching for PowerPoint, we should reach for pen and paper. On the whole I think I got these across. It could have been sharper, it could have been slicker, it certainly could have been more visible, but it worked. The purpose of a presentation is to convey a message, the audience don’t have to like it, agree with it or enjoy the experience for it to be a good presentation. If they do like, agree and/or enjoy the presentation, GREAT! But really, it’s about making them think afterwards. What do you think? How did I do? Does it work well on the web?